Do you have an old gadget you're looking to get rid of? Do you hate the thought of it going to waste? Are you in need of extra cash? The answer to all of these questions is Gazelle.com. They provide an easy, fast, and safe way for you to sell electronics and recycle electronics. When you sell cell phones, mp3 players, laptops, or other gadgets to Gazelle.com, you'll earn cash and help save the environment by keeping old, used gadgets out of landfills. Save on your next purchase from Gazelle.com with Gazelle discounts, Gazelle coupons and Gazelle savings from 58coupons.com. 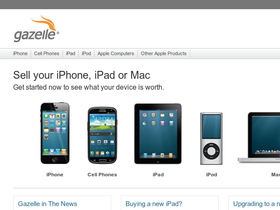 Gazelle.com is now offering $100 or more for old iPhones. Click link to sell yours. Check out Gazelle.com and get free shipping on your electronics. Click link to get started. Sell your used phones, laptops, iPods, etc. to Gazelle.com and they'll give you cash, no questions asked. Click link to get some extra dough. At Gazelle you have the option to have the money sent to you or your cause. Click link for details.